The photo speaks for itself, though I would like to add that this scooter was not tagged yet could still take off with traffic and keep up to 50MPH with no problem whatsoever. 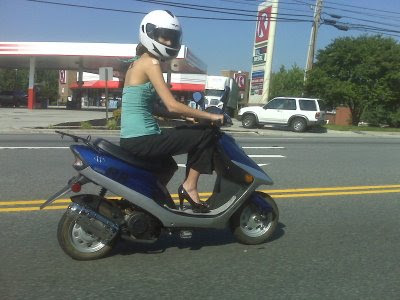 You have to be 50cc's or less and there's no 50cc scooter that can do 50MPH that I've ever seen. Mid 30's at best. This thing had to be hopped up big time.